I recently finished a lovely book, How the Light Gets in—Writing as Spiritual Practice, by Pat Schneider. As you can see from the picture pasted below, I underlined and tagged many pages. How the Light Gets In earned a place on my favorite books shelf. I love books that are part memoir and part instructional manual. Schneider takes readers on a journey of her life and highlights the links between writing, spirituality, and healing. In the final chapter, she makes several poignant statements about vocation or calling. Schneider suggests that each person, no matter what the social category; age, gender, race, or social status possesses a calling. Similarly, I would argue even more passionately that each of us is constantly being called. But most people appear confused about what a vocation or calling is. My former students believed that vocation or calling are terms only applicable to the ministry. As I tried to disavow them of this misnomer, I wondered what would happen if educational institutions took the discernment of a vocational or calling as serious as seminaries do. As an academic adviser, I hoped a structured discernment process existed for students interested in all occupations. Moreover, the issue of calling arises many times over the course of a lifetime. Currently, questions about calling dominate my conversations with adults of varying ages, even some I perceive as elders in spiritual direction/companioning. Pat Schneider maintains one method of discovering a calling is to pay attention to what brings you joy. This idea is very similar to Howard Thurman’s famous quote: “Don’t ask what the world needs. Ask what makes you come alive, and go do it. Because what the world needs is people who can come alive” or Joseph Campbell’s admonition “Follow your bliss.” What would the world be like if every person could listen for and become engaged in work or activities that brought them joy. Yet the quotes by Thurman and Campbell allude to a different term; passion. Are they the same or interchangeable experiences? Synonyms of passion include fervor, enthusiasm, zeal or an intense desire while descriptions of joy include delight, pleasure, happiness, and jubilation. Is there something special about the feeling of joy that is different from passion? I see this contrast playing out in my life. I held a passion for teaching but now I know deeper joy. It almost feels oxymoronic for me to declare the delight I feel when I arise to work. Eagerly I sit down to my desk to write or to greet those who walk through my front door for spiritual direction/companioning. I look forward to the retreats I lead and talking with spiritual seekers. What characterizes my present work that seemed absent in my past labors? I noticed as students, seated across from me on a couch or chair, talked about a variety of possible careers, there was a moment in the conversation when they lit up like a Christmas tree. The light in their eyes and the joy in their voices provided the mighty clues that we had stumbled upon a calling. A few students would note their own inner excitement, and pursue that path. Unfortunately, I also encountered students who could or would not follow their dreams. Many chose careers that their parents wanted for them or fields of study that might generate the most income. I would remind them that whatever vocation they chose, it would need to get them out of bed for the next 30 or more years. I counseled further that some occupational choices would be more difficult to undo than others. Becoming a doctor for example, involves a deep investment of time, energy, and money. Further, once students start families and begin to purchase cars and homes, changing careers becomes far more challenging, if not impossible. What is most remarkable is that my advice was quite similar to Patricia Schneider’s or Howard Thurman’s even though I neither knew of or had read anything by either author at that time. The experience of joy is important for daily life balance as well. The frenetic world we live in, burdened with overactivity, overstimulation, and relentless distractions requires counterbalancing. Joy helps to uncover the counterbalancing activities. What is most joyful—watching a movie, sitting outside in nature, listening to music, dancing in the living room, or reading a book? Regardless of the activity selected, it is essential to surround ourselves with our delights. Otherwise if we become stuck on the treadmill of life, the endless tasks will wear us down. We must get off for some rest and fun. Where is joy beckoning you? Following it whether it leads you to the kitchen to bake cookies or brownies, to the swings in a park, to a sporting event is what gives you vitality. Perhaps taking a moment to observe the changing colors of autumn leaves or watch hummingbirds and butterflies, will provide the joy that is the perfect antidote to what might ail you. Following your joy will definitely lead you to feel more of the peace and joy in your heart. There is one lesson I continue to learn over and over again. Seeking answers to the mysteries of life does not have to be complicated or expensive. The great African American theologian and mystic, Dr. Howard Thurman, writes about an oak tree that he turned to again and again for solace and strength. He said he would talk to the oak tree, sharing his triumphs and sorrows with it. As I began to reflect on my own contemplative spiritual journey, I thought about where and when I found renewal and guidance. For many years I chided myself for lacking the desire to take a pilgrimage, to walk the great El Camino, hike the Grand Canyon or walk the shores near Iona, Scotland. Sometimes I need not go any further than my own backyard or bedroom. Below is a description of my spiritual spot, my time and place that is equivalent to Dr. Thurman’s oak tree. It is my bed in the morning wherever I am. I turned over in my bed just becoming aware of the early morning quiet. Awakening among tossed pillows, sheets, and lightweight blankets always offered a place of strength and solace for me. The tranquility of daybreak reminded me of the times as a child I spent sitting in the wind inhaling the deep peace within it. As, “Little Rita,” my childhood nickname, I didn’t understand why I was so drawn to serenity or that a bed and the daybreak hush would serve as my anchor for an unimaginable life journey. From morning calm, I donned my uniform to march off to master the discipline of parochial school, and later arose to face a sea of white faces, as the lone brown one in my college classrooms. In the newness of morning, I jumped out of the bed to boldly defend my dissertation, and then later sobbed into its fitted sheets when I realized that my tenure denial wasn’t a dream but a real professional and public humiliation. Still the early morning calm gave birth to the strength and wisdom I needed as a professor to awaken students for more than 30 years. Virgin time and the caress of handmade quilts created a space where I summoned the courage to face a looming heart transplant, and ten years later accepted the diagnosis of renal failure knowing my recovery would require months of dialysis and another transplant. Opening my eyes in great joy, I awoke in the freshness of the day to see my wedding dress hanging across the hotel room, celebrating in my new heart my imminent marriage. After a restless night of grief, I grabbed my teddy bears and tissues, and wailed into the pillows as I felt the sting of being orphaned, now with both parents deceased. In all of these moments, I knew that the constancy of a sturdy bed whether in homes, college dorms, hotels or hospitals, and the Guidance revealed in a touch of morning stillness would steer me through anything. Howard Thurman found peace and understanding from an old, sturdy oak tree near his home. Memories of times with that tree sustained him throughout his life. For me, I acquire wisdom and courage in bed in morning quiet to walk the spiritual path. Where do you go to refuel, to connect with inner wisdom? When do you pause to capture moments of calm and serenity, and to gather the strength to endure the vicissitudes of life? How can you experience the peace and joy in your heart? 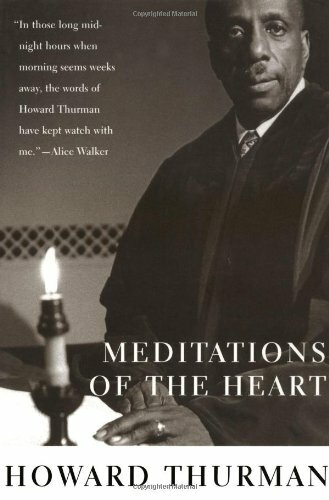 Howard Thurman, With Hand and Heart-The Autobiography of Howard Thurman. New York: Harcourt Brace & Company, 1981, p. 9. Elizabeth Yates, Howard Thurman: Portrait of a Practical Dreamer. New York: The John Day Company, 1964, p. 30. Recently I led a Quiet Day at a local retreat center on Howard Thurman who was mentor and spiritual adviser to Dr. Martin Luther King, Jr. What is a Quiet Day you might ask? I describe it as a weekend silent retreat packed into a single day. It provides each person in attendance an opportunity to disconnect from the world for a few hours, power down the electronic devices and get off the grid. A Quiet Day allows for calming the inner chatter and just basking in the stillness that lies below it in our minds. Actually I’ve noticed that most environments especially natural settings possess quiet, stillness, and serenity until we introduce noise into them. A certain joy always emanates from the peace nestling in such places. In preparation for the Quiet Day, I learned some new things about Howard Thurman and what brought peace and joy to his heart. As I’ve mentioned in previous posts, Thurman was an extraordinary mystic, theologian and preacher and his life and writings offer a number of suggestions about how to live in a world of turmoil yet keep a certain awe, peace and hope in one’s heart. I want to share a few examples from his life here. Howard Thurman found great peace outside in nature. He grew up in Daytona Beach so as a young boy he often heard the rush of the ocean, the tides washing against the rocks as well as the sea gulls adding a song each morning. There was something calming in the sound of the sea and he felt a certain serenity as he gazed at and rowed across the Halifax River near his childhood home. Thurman also spoke of a favorite oak tree. He gained great wisdom from just observing the tree. He noticed that when big wind and rain storms came off the ocean, the tree limbs and branches would swing and sway in the storm, but the tree never toppled over. There was something about having a strong foundation and deep roots that kept it upright even though tossed and turned in a storm. Thurman knew the tree represented something about his center, a sense he possessed that as external events might appear chaotic, he could remain rooted and not be subject to the whims of life. Thurman also talked to the oak tree. He felt like the tree somehow listened deeply and carried some of his burdens for him. Sometimes he felt if he sat below the tree in quiet, he heard an answer to some burning question or issue he lay before it. Thurman’s experiences remind me of my own many years ago when I lived in Santa Cruz, CA as a college student. I moved into a duplex my senior year that was located not far from the ocean. I too, could hear the ocean at night and there was a definite calmness that was brought on by listening to the ocean. In addition, I found a special large rock that I sat on and gazed out into the sea. I would go there and share my joys, sorrows and even ask some questions of the vast ocean. It’s the one thing I missed most after I graduated and left California. Thurman was a lover of silence and stillness. He observed that we need to stop the traffic in our minds sometimes just so we can get a grip on what is going in our lives, to better understand the people that we are, and determine what we want. He advocated silence for everyone but especially for those who were on the front lines of the Civil Rights Movement. He felt that each one of us needs a sanctuary, a place to go where we could garner peace as well as inner strength. For Thurman taking some time for silence was the human equivalent of refueling ourselves. Thurman and Gandhi both (they met in 1936) felt that the vitality needed to change one’s circumstances whether they be personal or on a larger social scale came from feeding one’s spirit just like we drink and eat to feed our bodies. That nurturing of spirit comes through stopping and being quiet as often as we can. Some people might label this kind of lifestyle “contemplative living,” or a life of living in the present (practicing mindfulness ) and in the Presence. Is there some aspect of nature that calms you? Perhaps it is the sound of running water or the birds singing or the tapping of a woodpecker. Maybe the wind gushing through the singing pine trees, or watching snowflakes gently kiss the ground gives you a sense of inner peace. How has nature befriended or nurtured you? Do you have a special tree, rock, lake, stream, park, garden, or place you can go to take your cares to? Could playing calm music while you complete daily chores like getting ready for school, cooking or cleaning or driving to work create a more serene atmosphere? I am certain Howard Thurman would be delighted to know that a Quiet Day was held to listen to a few of his meditations, walk around in nature and have contact with the stillness in our minds. In fact, I am certain if he were still alive, the mere idea of a Quiet Day would make his heart sing. Perhaps in the midst of the political turmoil dancing all around or during the doldrums of February, the deep days of winter, you might create a “quiet day” in your own home, allowing the songs of the birds to be your music, a crackling fire to provide you with beauty and healthy snacks to nourish your body. I suspect like Howard Thurman, a day of quiet will kindle some deep peace and joy in your heart. I think I have Howard Thurmanitis. Yes, my last post was about him and I made up that name. But after giving two workshops on his writings in the span of three days, one at a conference devoted to his life and work, it fits. I love talking and writing about Howard Thurman, about his love for nature, stillness and silence. I resonate with the fact that as a young boy he was a contemplative and a mystic. He felt called to something deeper and he followed that call throughout his life. In some ways it feels like a betrayal of sorts, expressing love for a man other than my husband. Yet my guilt is lessened by the fact that Howard Thurman has been dead for more than three decades. He continues to speak to me, though, through his writings, his lectures, his sermons, his love for the Sacred everywhere. His quest for a profound experience of the Presence, of connection to all living things acts as a role model for me as a spiritual pilgrim stumbling along what sometimes feels like as an unknown path. On occasion I sense that I am wandering away from the Peace in my heart and at other times I march steadily toward it. Thurman’s writings, lectures and sermons feel like worthy companions to take along the way. I remember wandering around in my mind pondering what I could write about. In order to complete my spiritual direction training at the Shalem Institute for Spiritual Formation I needed a subject for my final project. Fulfilling the requirements could involve a creative work, like building a labyrinth, composing sacred poetry or planning a silent retreat. Another option was to write about someone, a mystic or spiritual person. I wanted to research and write about a specific person, someone I could get to know intimately, to learn about how his or her spirituality unfolded. I enjoyed reading about many of the mystics especially St. Theresa of Avila and St. John of the Cross but they felt so ancient and far away. I also knew there were more contemporary figures like Thomas Merton and Evelyn Underhill. Yet most mystics were typically nuns or monks, basically religious who lived in community. I was curious if there were “ordinary mystics” as Marsha Sinetar refers to them in her book, Ordinary People as Monks and Mystics: Lifestyles for Spiritual Wholeness, regular people who communicated about their everyday mystical experiences. Was there anyone out there who wasn’t living in a religious community but seemed to have contact with a Presence they couldn’t logically explain? Were people having “peak experiences” as William Maslow labeled them? Was there anyone listening to or following his or her heart? I frequently experience mystical moments in the quiet of the morning or when I awake from a nap. Sometimes a feeling of Oneness engulfs me when I view a gorgeous sunset or a vista of mountains. When I find myself in the “thin space” as it is sometimes referred to—that place where heaven and earth appear to merge if only for a moment—my connection to a larger whole is palpable. For a split second, I feel like the sun, the moon, and the trees all at once. I continued to badger my spiritual comrades about ordinary mystics until a pastoral counselor friend asked if I had heard of Howard Thurman. Given all of the spiritual material I’d read over the years and for my spiritual guidance program I was embarrassed to discover that he was unknown to me. After perusing his autobiography, With Hand and Heart-The Autobiography of Howard Thurman, I learned he had written over 20 books, served as a spiritual adviser to Martin Luther King, Jr. and was a “godfather” of sorts to the Civil Rights movement. I was crestfallen to learned that he died in 1981. I could have met him several times had I known about his existence earlier. As a boy, Howard Thurman lived near the ocean in Daytona Beach, Florida and as he listened to it, he felt a Presence that held and embraced him. In addition he became attached to a tall, solid oak tree in his backyard. Thurman noticed that when the storms came off the ocean, while many trees toppled, the old oak tree stood firm. Like the tree, Thurman sensed there was something inside of him, strong as that oak tree that could withstand the tempest and storms of his life. How Good to Center Down! How good it is to center down! To sit quietly and see one’s self pass by! While something deep within hungers and thirsts for the still moment and the resting lull. A direction, a strong sure purpose that will structure our confusion and bring meaning in our chaos. We look at ourselves in this waiting moment—the kinds of people we are. The questions persist: what are we doing with our lives?—what are the motives that order our days? What is the end of our doings? Where are we trying to go? Where do we put the emphasis and where are our values focused? For what end do we make sacrifices? Where is my treasure and what do I love most in life? What do I hate most in life and to what am I true? Over and over the questions beat upon the waiting moment. A deeper note which only the stillness of the heart makes clear. With the peace of the Eternal in our step. How good it is to center down! Sometimes just reading one of Thurman’s meditations renews the Peace in my heart. Google him, view one of his videos and see if his commanding voice does the same for you. Have you ever come away from a “mystical or peak experience “ with a greater sense of Peace, a sense that Someone or Something loves and cares for you? Have you ever found yourself out in nature—listening to the ocean crashing against the rocks or the chirping birds in early morning or felt awe at the sight of the green leaves of tall trees against the backdrop of a blue sky? Just for a moment were you touched by a Oneness with everything that gave you a deep Peace and abiding Joy? Next time you have an opportunity to pause and be present— to feel that sense of unity with everyone and everything, grab it. See if it might lead you to uncovering more of the peace and joy in your heart.